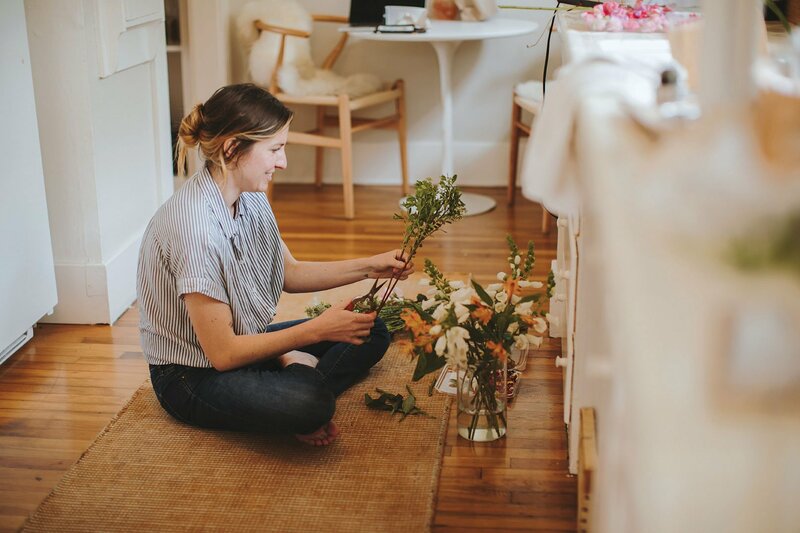 Native Poppy’s Natalie Gill makes flowers an essential, every day part of her life. Flowers can be an essential and renewing part of your day-to-day life, advocates Natalie Gill (above), whose floral design company Native Poppy, after sharing retail space with craft coffee purveyor Communal Coffee for years, just opened their own retail venue in South Park. Natalie acknowledges that some people consider cut flowers a superfluous purchase, but their fleeting beauty is part of the allure. “Why wouldn’t you want to watch flowers go through their life cycle?” she muses. 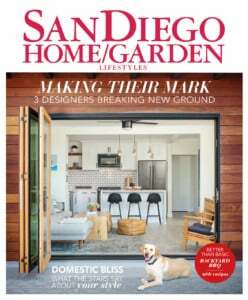 Her taste in bouquets is “garden style,” she says, explaining that she prefers to mimic nature by intermingling wildflowers in a mix of colors, sizes and varieties. “In nature, you don’t see tight rows of exactly the same flower, but instead some grow taller, wider and fight for light,” Natalie says. The “power of the flower” can extend to every aspect of your life, Natalie says. She offers these tips to fill your day with blooms. Botanicals are wholesome additions to your beauty routine, for use as facial toners and aromatherapy in the bath and shower. 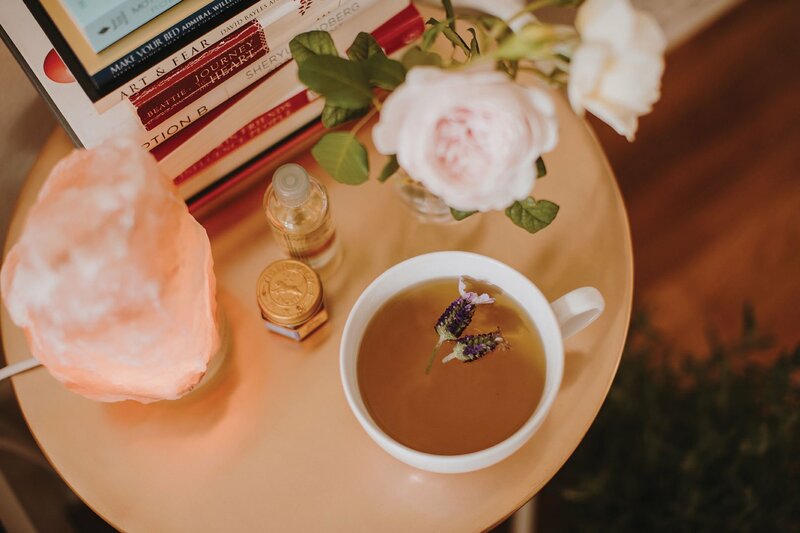 “There’s a shift away from using chemicals,” Natalie says and she personally likes to add a dash of lavender to bath water, hang eucalyptus in the shower, and make a “tea” of concentrated floral and herb mixtures with hot water for a facial steam. To get the full benefit of facial steams, Natalie suggests draping a towel over your head and the bowl to allow the warmth to open pores and the scent to encourage meditative breathing. 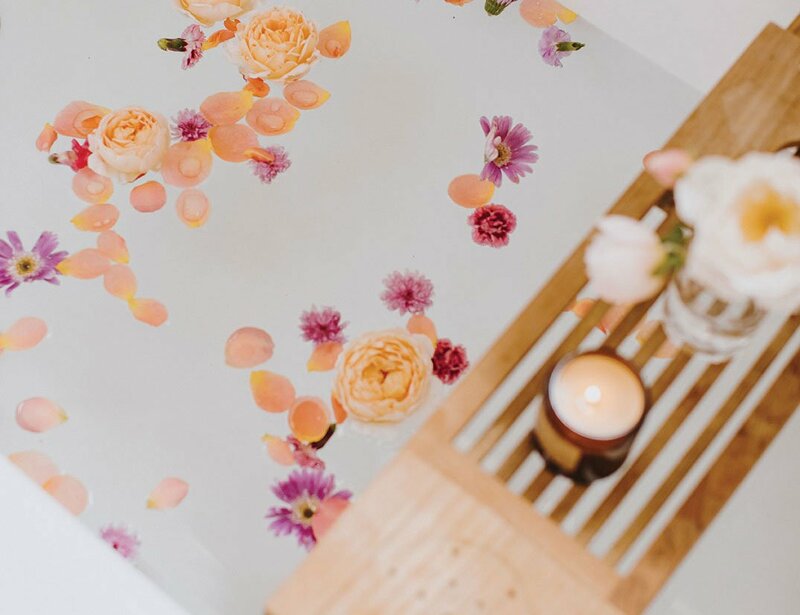 Taking a floral bath is not only aesthetically pleasing, there are lots of physical benefits too. Combine your favorite buds, petals and herbs for a customized wellness treatment that can hydrate, calm, tone and more. As the adage goes, you eat with your eyes first. 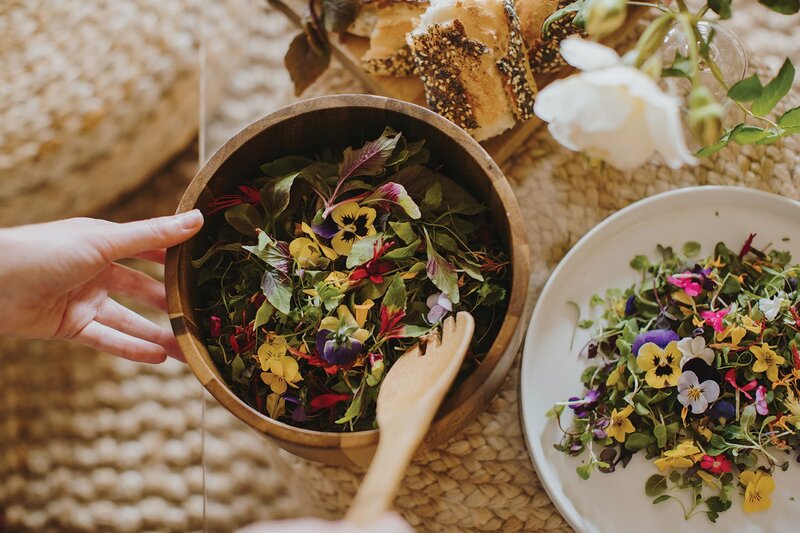 Natalie likes to go to specialty produce stores to find edible flowers to brighten up cocktails, salads and charcuterie boards. Flowers also make lovely cake toppers. “One of my friends doesn’t like sprinkles on her birthday cake, so flowers make it cute,” Natalie says. Loose-leaf teas are an effortless way to infuse your diet with aromatic plant material. Natalie enjoys an invigorating blend of cinnamon bark, orange peels, rose buds and damiana leaves. 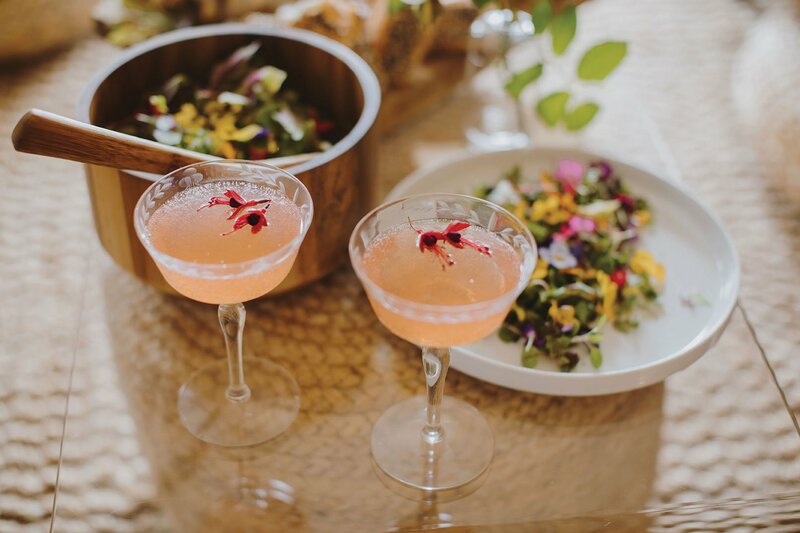 Amateur chefs and cocktail makers inject personality, color and texture into the food and drinks they create with edible flowers. A few to try include peppery nasturtiums, lettuce-like pansies and cucumber-tasting borage flowers. 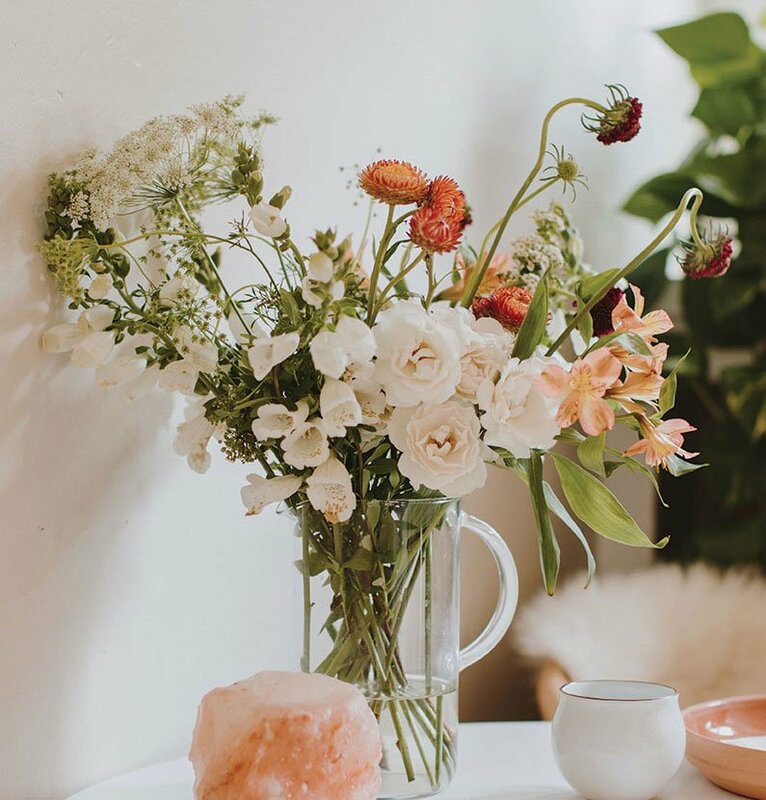 Natalie thinks flowers should be an essential element of your workspace and home environment to foster creativity, reduce anxiety and boost energy. 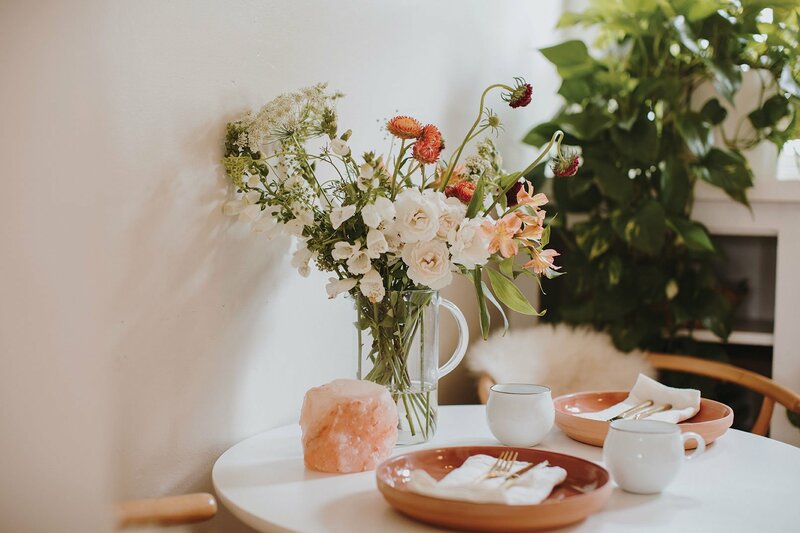 Incorporating more flowers in your decor can be as simple as a tabletop bud vase for small blooms such as the one Kasia Mikulska of Plenty of Petals arranges at left. “Flowers really do bring joy and happiness to your life,” Natalie says, referencing a 2008 clinical trial that suggested surgical patients with flowers in their hospital rooms experienced better physiological recovery results. To have fresh flowers for days, cut stems at an angle, change the water at least every other day and use a floral preservative. Natalie says flowers are intrinsically meditative because they can tap into all the senses: sight, smell, touch, sound, and taste. 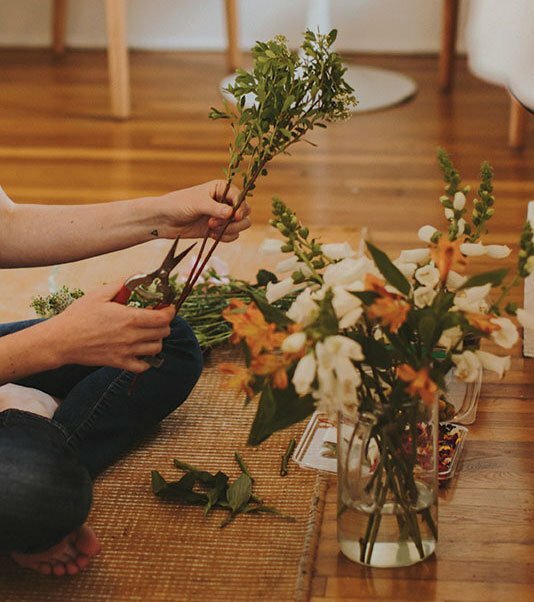 She encourages her clients to take that one step further by considering flower arranging as an artful meditation practice. Encourage sweet dreams by prepping your sleeping quarters with floral scents like lavender, rose and jasmine. 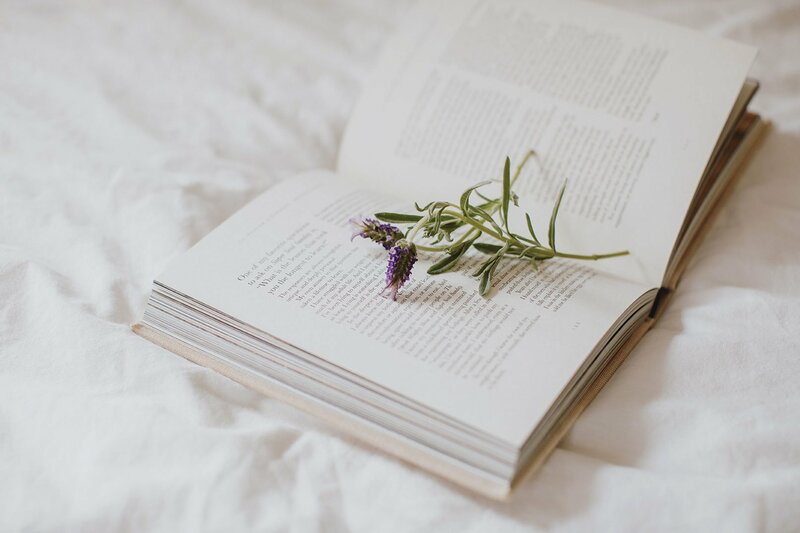 Natalie suggests placing flowers on a nightstand and dried flower sachets under your pillow, or misting your bed linens with essential oils for a fragrant slumber. Even laundry detergents are available in calming floral scents. Studies show that the flowering plant in the mint family does, in fact, help put you in a relaxed state, so it works well as part of a calming bedtime routine. 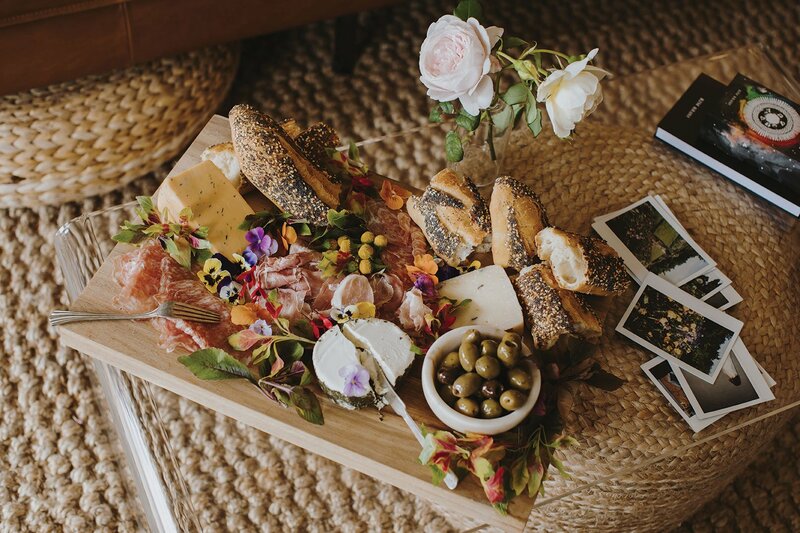 Flowers express love, and make thoughtful gifts for dinner hosts and baby showers. “It’s such a sweet and simple gift,” Natalie says.